Having just come back from a quick trip to Bogotá where there was no time to sight-see in amongst the errands we had to run, a striking piece of street art took me back to the 4 weeks I spent in Bogotá in 2011 before travelling to Santa Marta and meeting mi novio. One of the things the most notable things in Bogotá is the street art. I saw it everywhere as I wandered the streets of La Candelaria and I wanted to find out more. The street art in Bogotá is particularly striking because it is more design and imagery and less simple tagging. To me this is art. I stumbled across a flyer on the pinboard at my Spanish school for a graffiti tour and managed to talk two classmates, including a girl who has also produced her own street art in Switzerland, into going on the tour with me. We met with Christian, an Australian expat and the man behind Bogota Graffiti Tours, at the Parque de los Periodistas for the tour and learned that they were in their first few weeks of operating the tours. Christian took us around La Candelaria and then further afield to see major street art pieces by well-known local and international artists and explained the many techniques and signature styles of the work. It was fascinating. Seeing walls like the one in this photo make me happy. It feeds my soul. All of Bogotá is a gallery and these pieces have their place in time. From the moment they are completed the murals begin to change and evolve with weather and other factors. But this also is accessible art where you can get up close to, touch and photograph the pieces without a security guard telling you off. 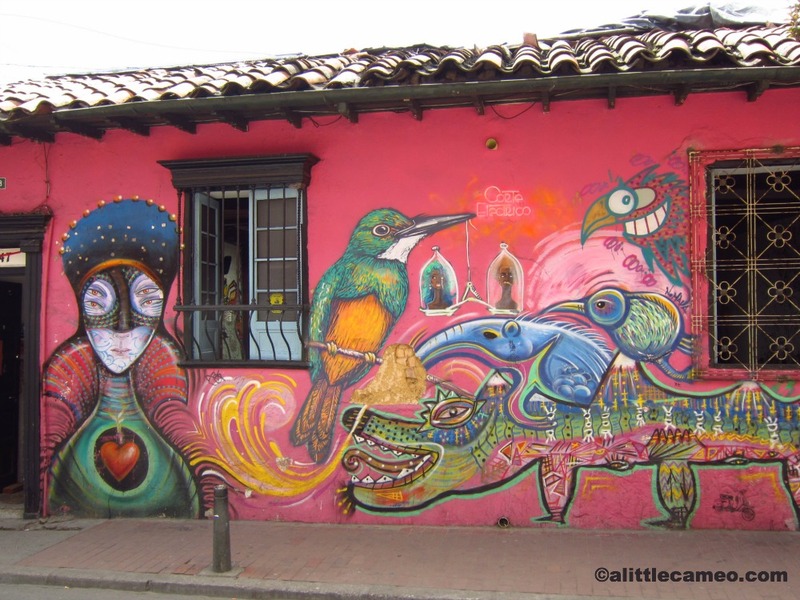 For me, the street art in Bogotá was the first sign of a cultural smorgasbord waiting to be discovered in the city. I can´t wait to keep discovering more. The Photo Vault is where I will be sharing my favourite photos (and their stories) that deserve better than being lost in the depths of my iPhoto never to be shared. Hi Yakalita, that´s a shame you missed the graffiti tour, but yes, it does give you a reason to come back! They only go three times a week so make sure when you come back to Colombia you are in Bogotá on one of those days. Cool. Thanks for the tip. I am bookmarking the link you posted for the tours right now so I don’t forget! I used to live in the center if bogota (6 months in the center, 2.5 years total in Colombia) and was always impressed by the graffiti art in la candelaria. A lot of, not all of it, but a lot was quite good and thought provoking. Enjoyed this post! Thanks! I especially love the really colourful, elaborate pieces. I think they are my favourites.